Rotterdam is the second-largest city in the Netherlands but, unlike Amsterdam, it didn’t escape the Second World War unscathed. The Rotterdam Blitz occurred nearly 74 years ago, on May 14, 1940, when Adolf Hitler ordered the city bombed as part of the Nazi invasion of the Netherlands. Nearly the entire city centre – save for a few historic buildings – was destroyed, and almost 900 were killed. Those who survived the Blitz were almost inevitably rendered homeless. Today, the only remnant of medieval Rotterdam left standing is Grote of Sint-Laurenskerk, or Great St. Lawrence Church, constructed between 1449 and 1525. 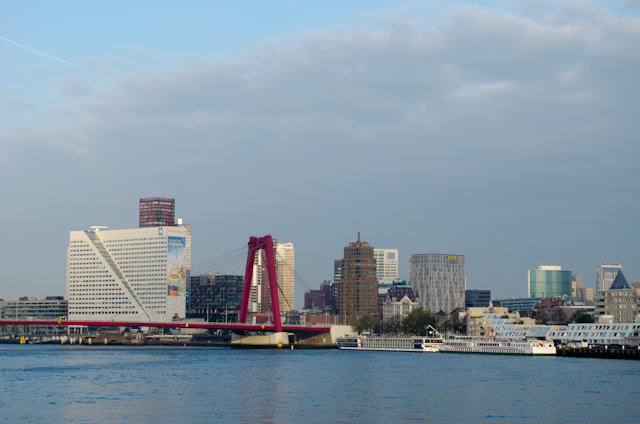 But if old Rotterdam is no more, the new Rotterdam is a shining example of modern Dutch architecture and sensibilities. Colourful buildings with innovative, modern architecture adorn nearly every streetcorner, like some curious new-age cornucopia. But while modern Dutch architecture has the same sleek, clean sensibilities as its Scandinavian counterpart, it lacks the often cold design elements of its northern counterparts. What I most wanted to do today was twofold: while most guests were headed to Delft – famous for its Delft Tile works – I wanted to take one of the Inspire’s bicycles for a spin again. 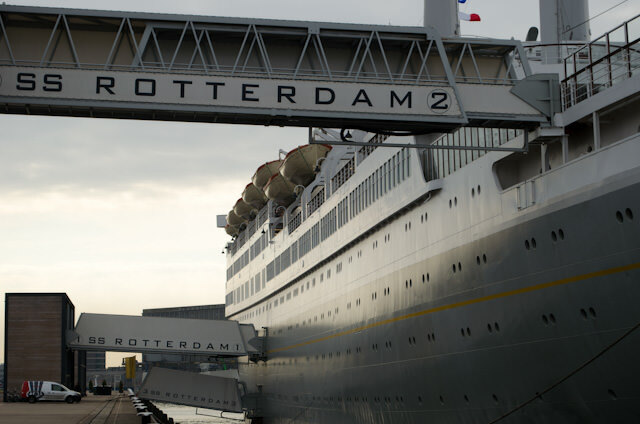 I also wanted to see Holland America Line’s classic SS Rotterdam, now moored as a permanent hotel in Rotterdam after a long career as an ocean liner and cruise ship. And because Tauck is all about choice, both of those ideas were possible. Although now based in Seattle, Holland America Line is one of the Netherland’s greatest institutions, and the 1959-built Rotterdam is one of the last great Dutch “ships of state.” She served with Holland America Line from her inaugural voyage presided over by Queen Juliana until 1997, when she was retired from cruising service. She was sold to Premier Cruises and operated for a time as their Rembrandt until Premier went belly-up in September of 2000. 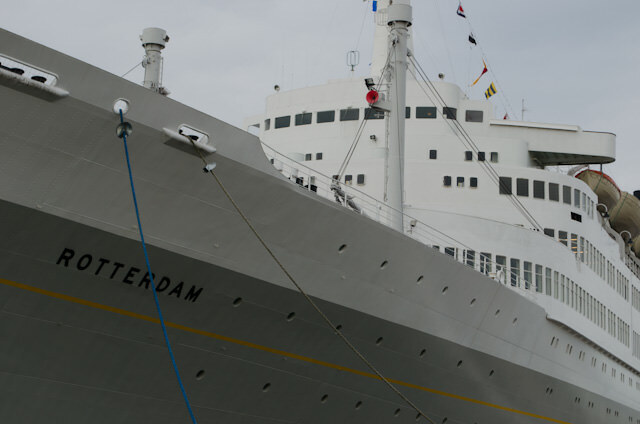 Arrested in Halifax, Nova Scotia, it looked like Rotterdam was headed to the breakers at Alang, India until 2004, when she had her asbestos removed and hull repainted in Holland America’s 1950’s grey-and-yellow livery. 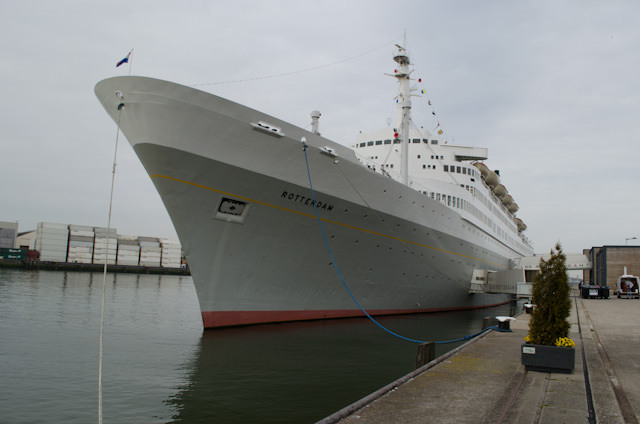 Four years later, on August 8, 2008, she arrived once again in her namesake city to begin a Queen Mary-esque career as a floating hotel and restaurant. I have always wanted to see the Rotterdam. I’ve enjoyed many Holland America Line cruises, and the old Rotterdam was the one ship that escaped me. She was retired in 1997, and I never began cruising until 1998. 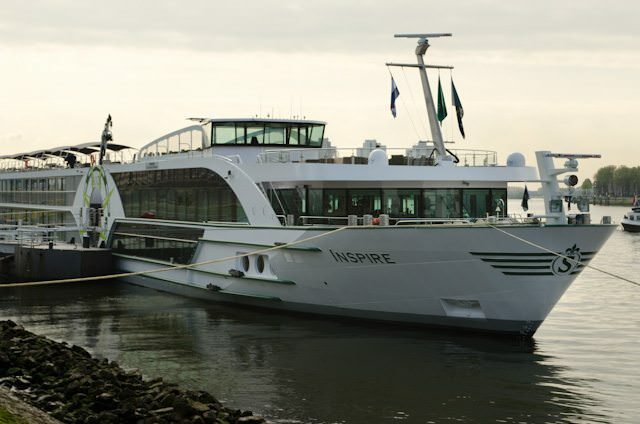 So, to visit her – albeit briefly – I cycled six kilometres in each direction from Tauck’s brand-new ms Inspire to the SS Rotterdam’s final resting place in South Rotterdam at 3e Katendrechtsehoofd 25.